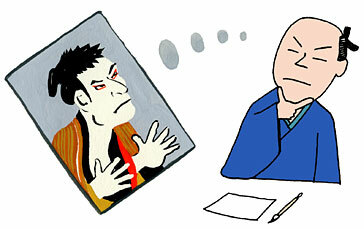 TRIVIA of Noh : Q53 : Was Sharaku, a great ukiyo-e master, also a Noh actor? | Home | Trivia | Q53 : Was Sharaku, a great ukiyo-e master, also a Noh actor? Was Sharaku, a great ukiyo-e master, also a Noh actor? In the Edo era, there were more than 300 Noh actors in Edo (currently Tokyo). Not all of them appeared on stage all the time, however. They worked two types of schedule: a yearly cycle, on duty from May to October and off duty for the other months; or a two-year cycle, on duty for a year from May to April and off duty for the other year. Although it was not officially approved, some of the actors worked as musicians in kabuki theatres during their off-duty periods. Artistic exchanges may have taken place, and kabuki actors might have studied essential elements of Noh. Sharaku is one of the Edo era’s masters of woodblock printing (ukiyo-e). Although he is considered a man of mystery and sometimes even his existence is doubted, the latest studies argue convincingly that he was a Noh actor called Saitō Jūrobē from the Awa region (currently Tokushima). He was only active for less than a year, but it is believed that his depictions of kabuki actors may have been from his close observations of them during his off-duty period.